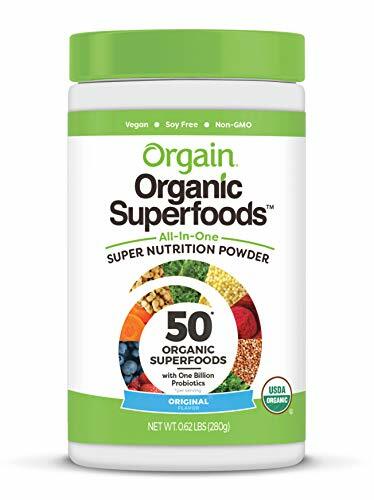 50 superfoods per scoop from Orgain's original organic super sprouts, fruits, berries, veggie, greens, grasses, and foods blends. 1 billion clinically proven probiotics, 6 grams of organic dietary fiber, high in antioxidants. Supplement your diet with superfoods, antioxidants, and probiotics to help support digestive and gut health. Superfoods in this powder include beets, ginger, turmeric, wheatgrass, barley grass, spinach, broccoli, kale, acai, millet, amaranth, buckwheat, quinoa, chia, and flax. Ideal for healthy, on-the-go nourishment for men, women, and kids. Whether you are a busy professional, mom, dad, athlete or student, this is perfect as an antioxidant boost and an addition to your meal replacement shakes or pre and post workout drinks. Mix into water, juice, or your favorite smoothie recipe and enjoy! Great for overnight oats. If you have any questions about this product by Orgain, contact us by completing and submitting the form below. If you are looking for a specif part number, please include it with your message.